We all like to rest from time to time. * Taking a nap is a high priority for the young, for the older, and even for those in between. * How many of you. 1 We all like to rest from time to time. * Taking a nap is a high priority for the young, for the older, and even for those in between. * How many of you were able to get in that post Thanksgiving meal nap? * At Thanksgiving we can get very tired after the meal. * Why is that? * Some blame Tryptophan but it is really only a small part of the problem. 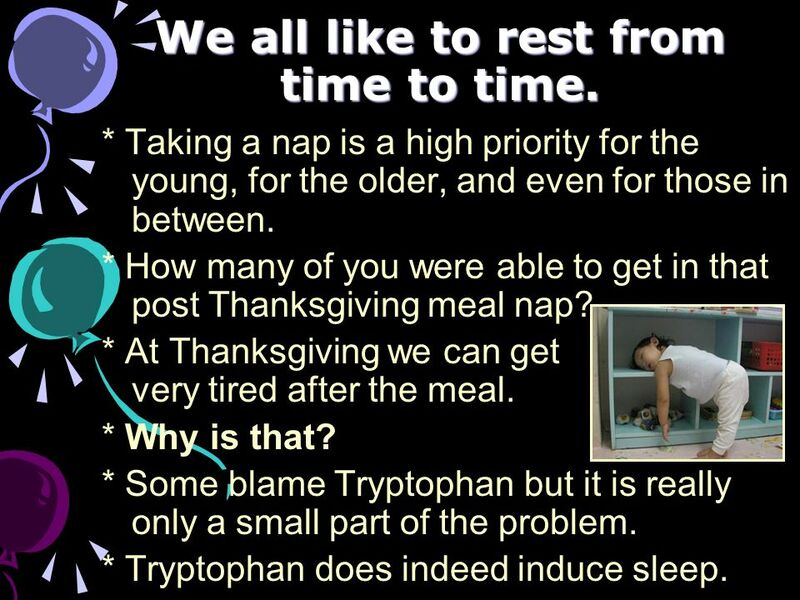 * Tryptophan does indeed induce sleep. 2 Tryptophan is not the only culprit. 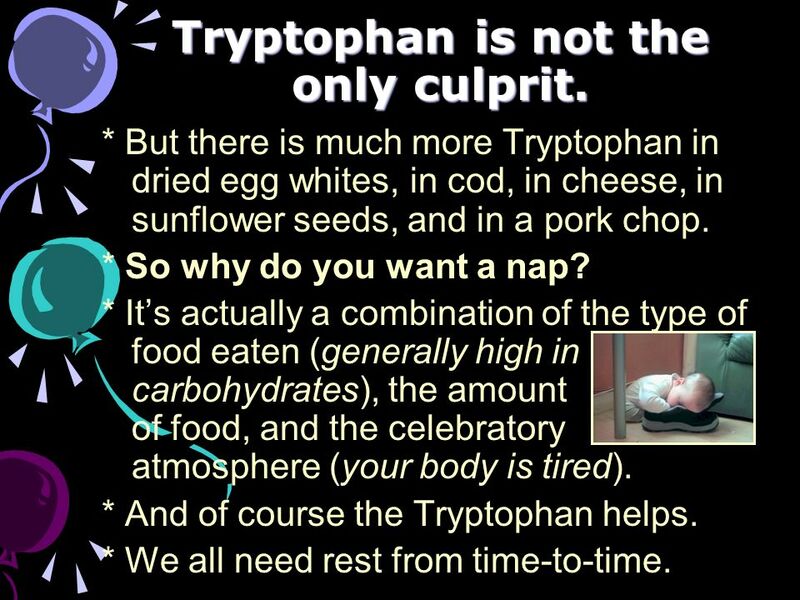 * But there is much more Tryptophan in dried egg whites, in cod, in cheese, in sunflower seeds, and in a pork chop. * So why do you want a nap? * Its actually a combination of the type of food eaten (generally high in carbohydrates), the amount of food, and the celebratory atmosphere (your body is tired). * And of course the Tryptophan helps. * We all need rest from time-to-time. 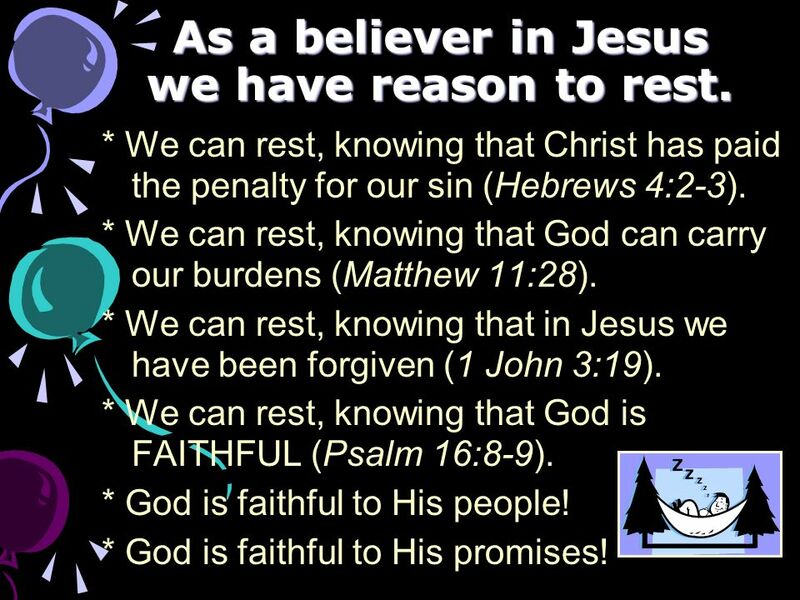 3 As a believer in Jesus we have reason to rest. * We can rest, knowing that Christ has paid the penalty for our sin (Hebrews 4:2-3). * We can rest, knowing that God can carry our burdens (Matthew 11:28). * We can rest, knowing that in Jesus we have been forgiven (1 John 3:19). * We can rest, knowing that God is FAITHFUL (Psalm 16:8-9). * God is faithful to His people! * God is faithful to His promises! 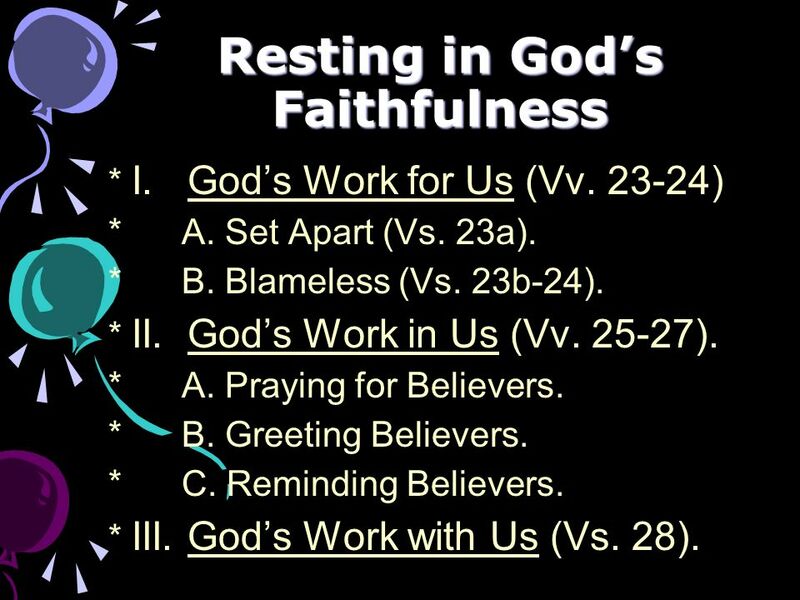 5 Resting in Gods Faithfulness * I. Gods Work for Us (Vv. 23-24) * A. Set Apart (Vs. 23a). * B. Blameless (Vs. 23b-24). * II. Gods Work in Us (Vv. 25-27). * A. Praying for Believers. * B. Greeting Believers. * C. Reminding Believers. * III. Gods Work with Us (Vs. 28). 7 Gods Work for Us * A. God is able to sanctify (set apart) those who believe in His Son. 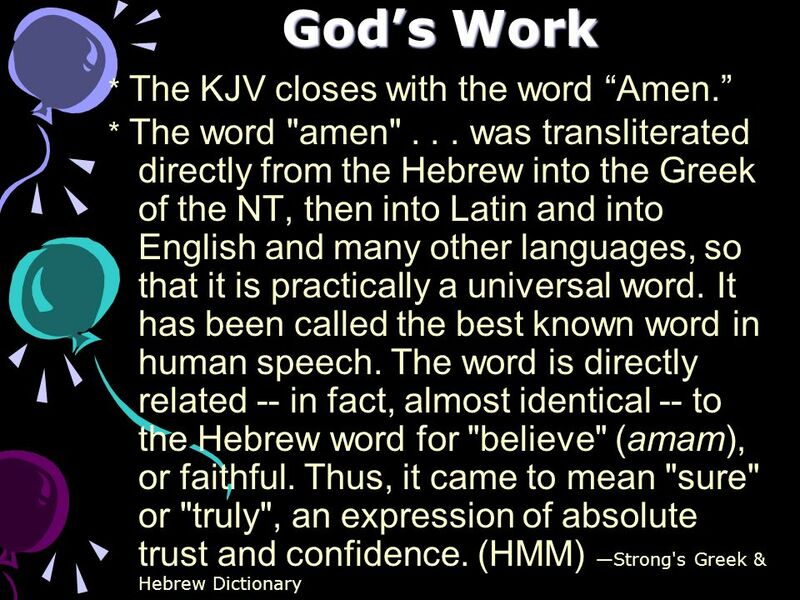 * Sanctify = hagiadzo - to separate from profane things and dedicate to God; to purify Strong's Greek & Hebrew Dictionary * God is in the business of forgiving us for our failures and cleansing us from our sin (1 John 1:9). * But we must desire holiness as well. * EX: Pests we tolerate. * Have you asked God to change you? 8 Gods Work for Us * A. God is able to sanctify (set apart) those who believe in His Son. * B. God is able to keep our whole spirit, soul and body blameless. * Blameless = amemptos – no blame; no legitimate ground for accusation – Bible Knowledge Commentary, 1983, page 709. * Have you asked God to forgive you? * Have you asked Him to cleanse you of your sins and failures? * God is able to make you blameless. 9 Gods Work * I. God works for us... and * II. God works in us. * Gods presence should be obvious in the life of a believer. * There should be an external change that reflects an internal change. * A. Praying for Believers. * The text commands us to pray for other believers. * Pray = Pres. Mid. Imperative – You yourselves are to keep on praying. 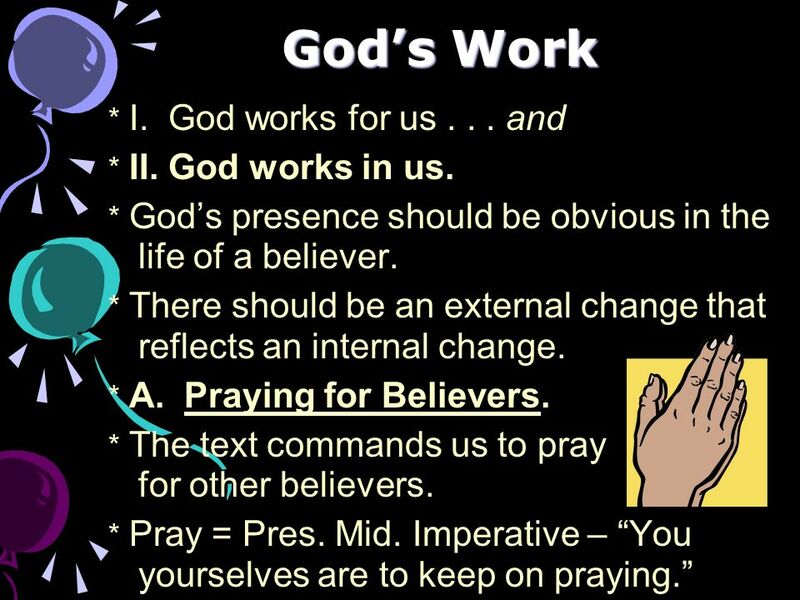 10 Gods Work in Us * A. Praying for Believers. * B. Greeting Believers. * When we set aside time in each service to greet one another, we are encouraging you be biblical. * Greet = Aor. Mid. Imperative – aspadzomai - to draw to one's self; to salute one, greet, bid welcome, wish well to; to receive joyfully, welcome Strong's Greek & Hebrew Dictionary * One of the sweetest sounds in a church is of people laughing and talking. 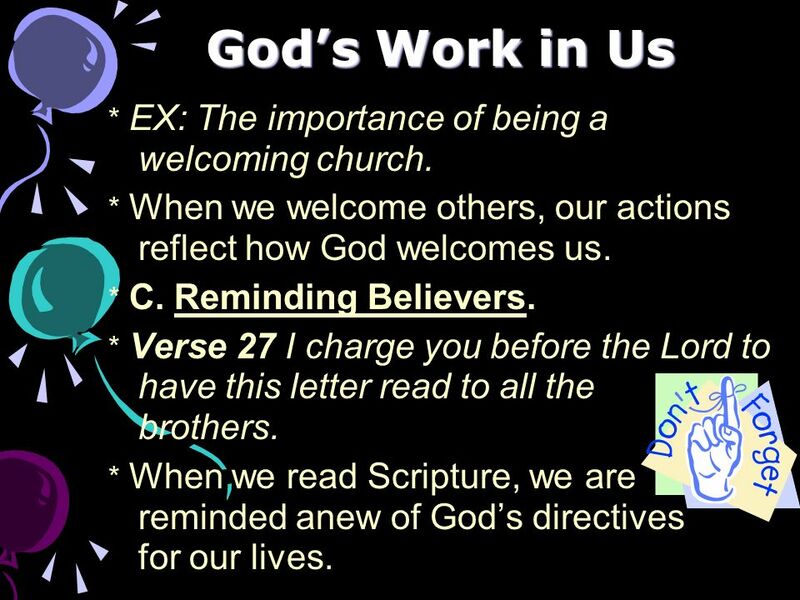 11 Gods Work in Us * EX: The importance of being a welcoming church. * When we welcome others, our actions reflect how God welcomes us. * C. Reminding Believers. * Verse 27 I charge you before the Lord to have this letter read to all the brothers. * When we read Scripture, we are reminded anew of Gods directives for our lives. 12 Gods Work in Us * Isaiah 55:10-11 10 As the rain and the snow come down from heaven, and do not return to it without watering the earth and making it bud and flourish, so that it yields seed for the sower and bread for the eater, 11 so is my word that goes out from my mouth: It will not return to me empty, but will accomplish what I desire and achieve the purpose for which I sent it. 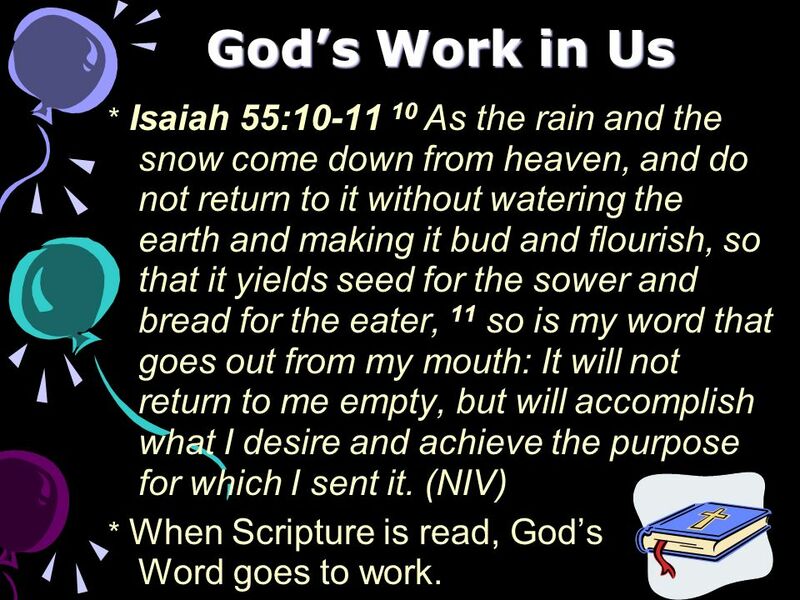 (NIV) * When Scripture is read, Gods Word goes to work. 13 Gods Work with Us * Verse 28 The grace of our Lord Jesus Christ be with you. 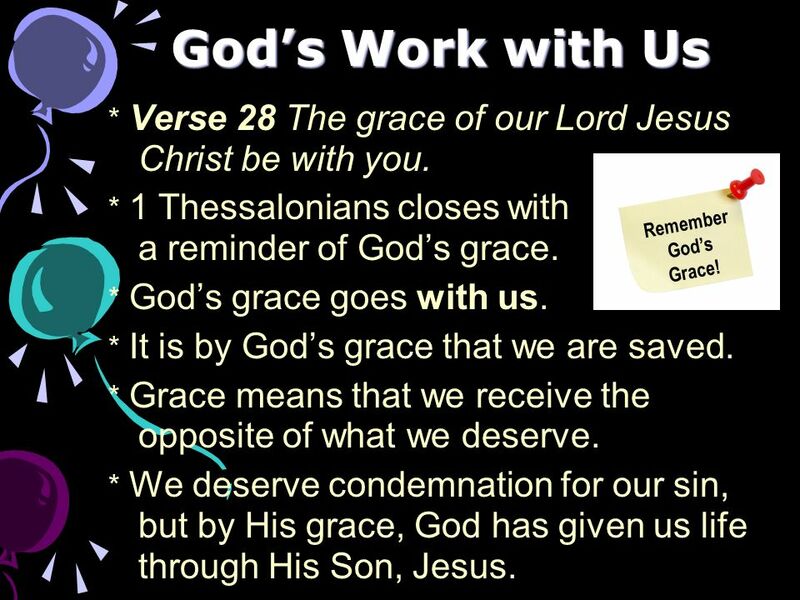 * 1 Thessalonians closes with a reminder of Gods grace. * Gods grace goes with us. * It is by Gods grace that we are saved. * Grace means that we receive the opposite of what we deserve. * We deserve condemnation for our sin, but by His grace, God has given us life through His Son, Jesus. Remember Gods Grace! 15 Gods Work * Have you accepted Gods grace? * It is a gift from God (Ephesians 2:8-9). * For any gift to have value, it must be opened and then applied. * Have you received Christ into your life? * Are you trusting in Him? * God is able to change you from the inside out. 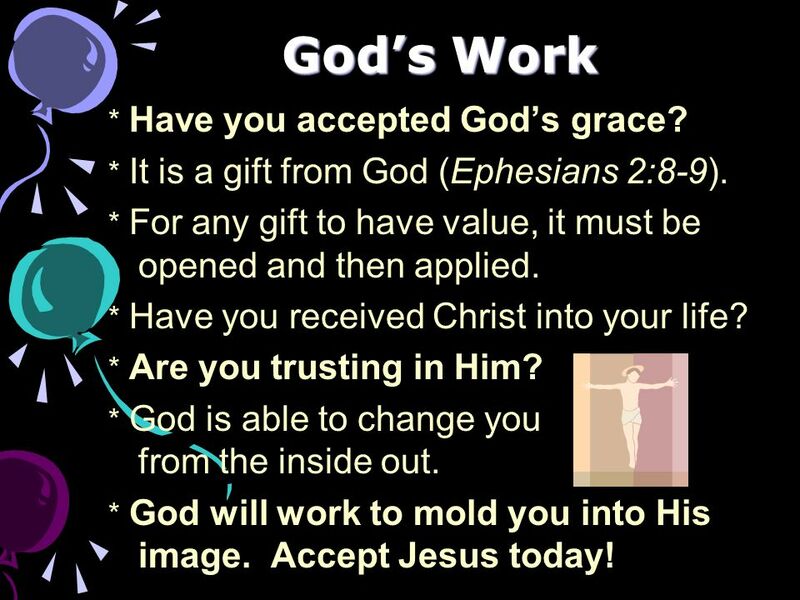 * God will work to mold you into His image. Accept Jesus today! Download ppt "We all like to rest from time to time. * Taking a nap is a high priority for the young, for the older, and even for those in between. * How many of you." Respect It was Rodney Dangerfield who popularized the expression, “I get no respect.” He would use the statement in many of his comedy routines. 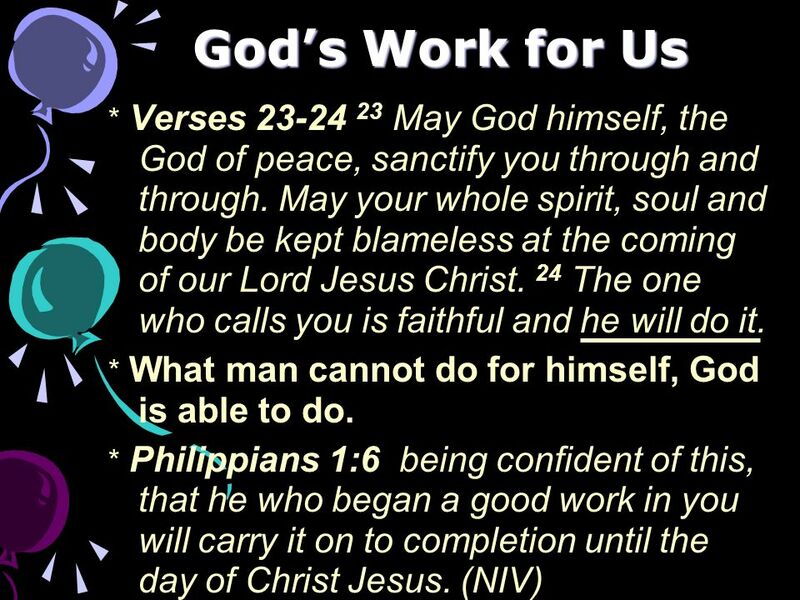 1 Thessalonians 5:23 Now may the God of peace himself sanctify you completely, and may your whole spirit and soul and body be kept blameless at the coming. Theme 2014: Experiencing God, Embracing People! Hebrews 3:16 – 4:13. THE PROBLEM…. After God created the world, man had a perfect, intimate relationship with God. I. Be Wholly Holy (23). God of peace Emphatic: “Himself” True peace comes from God alone Sanctify relationship 1. Begins w. relationship, Hb.10:10 repentance. Week 11 – “You Can’t Do It Alone”. Romans 7:18b-24a I have the desire to do what is good, but I cannot carry it out. 19 For what I do is not the good. Praying With Jesus The journey of entering into the life that is life.